Der T92 ist ein amerikanischer premium leichter Panzer der Stufe 8. Ein Projekt für einen luftgestützten leichten Panzer. Entwickelt von Aircraft Armaments als Ersatz für den M41. Der Entwurf umfasste viele Neuerungen. Zwei Prototypen wurden gebaut, die beide im Testgeländer Aberdeen getestet wurden. Juni 1958 wurde das Projekt eingestellt. Lowest alpha of Tier 8 lights with 150 damage, average DPM. Lowest top speed of Tier 8 lights at 60km/h. Though armor is sloped and rounded, unable to bounce shells due to thinness. Unusually wide for a light tank. The T92 is a classic scout tank in every sense of the word. Fans of support-oriented light tanks will feel right at home in this machine, as will light tank drivers who are used to being hell on treads at tier 8. Small, agile, fast, and lightly armed, the T92 not capable of taking the 'pocket medium' role that some light tanks can accept. Instead, it is designed to take advantage of four major light tank duties. 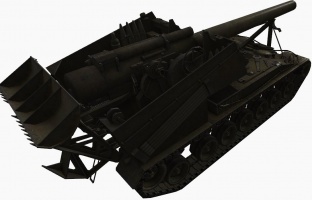 As a passive scout, it relies on its small size, 10 degrees of gun depression, and its 400 meter view range to quickly control ideal spotting positions. Though it is slow for a light tank at only 60 kph, the T92 accelerates exceptionally well and retains a lot of speed climbing hills or plowing through bad terrain. It can leave a WZ-132 behind on most forms of terrain and can even beat an LTTB in a sprint. Once in place, it can quietly hide out and keep an eye on enemy movement. If discovered or the situation becomes untenable, it can easily back off and relocate. As an active scout, it relies on its small size and good ground resistance to let it spot enemies on the move. The T92 is low but wide, giving it the ability to retain a lot of speed in fast maneuvers and avoid taking shots, especially at mid to long range. A madly swerving T92 can be almost impossible for some tanks to hit at medium range, especially for those with low shell velocity. The T92 is unusually gifted in this area as it barely needs to poke above ridges to accomplish its task, because its turret is practically all cupola. Peeking for an instant is usually enough to spot enemies. As a supporting flanker, it relies on good gun handling and its ability to quickly change firing positions to deal damage over the course of a game. A T92 will rarely take down a full health opponent, lacking alpha damage as it does. However, it has average DPM and an unusually good stock APCR round. While the penetration is average at best and the damage is laughable, it has a fast flight speed and, more importantly, retains penetration at all but the most extreme ranges, only dropping to 173mm of pen at 300 meters! This allows it to snipe at flanks with its normal ammunition. 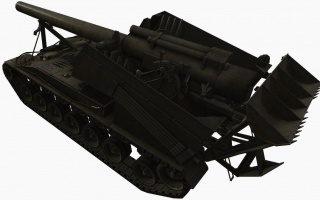 As an artillery/tank destroyer hunter, it relies on its mobility and ability to fire on the move to track down isolated enemies and harass them. The gun remains uncommonly accurate on the move, so use of the auto-aim feature is recommended, as this allows you to focus on the driving. Circle any isolated, unsupported, or over-extended enemies, then punish their weaker side and rear armor. Most artillery and casemate TDs such as the Ferdinand or even the mighty T95 can be brought low with this tactic. This is most effective towards the end of a match when enemies aren't coordinated. The T92 is absolutely abysmal at straight fights and will lose a fair fight with many tanks as low as tier 6, so don't accept them. Flank, disengage, hit enemies from odd positions. Stay still only for passive scouting; otherwise, take advantage of the many comfortable handling characteristics of this tank to keep your opponent guessing and wondering why they're constantly sprouting new bullet holes 150 HP at a time. 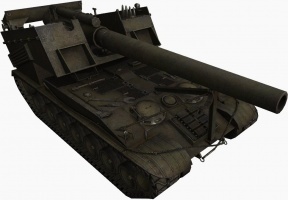 It received a hidden buff in update 9.21 that finally gave the tank some engine durability and brought the health of the engine up from a mere 104 to an acceptable 260, allowing it to survive more than one shell before breaking. 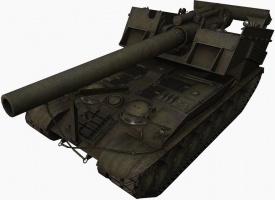 This means that a 88mm shell will no longer instantly knock out the engine on a hit. It is also less likely to completely lose both the tracks and the engine in a single shot from larger-caliber shells. While normally desirable, the Repair skill is less effective on the T92, as it is too fragile to survive long with a destroyed track or engine. Use of a Repair Kit is preferable. Off-Road Driving and Smooth Ride improve the T92's ground resistance and on-the-move gun handling, but their effect on these already-strong stats is minor, and so these can be taken later. For the same reason, the usually desirable Snap Shot can also be taken later, as its effect on the T92's already good gun handling is also minimal. Intuition is not useful due to the T92's fast and painless reload speed. As a premium vehicle, this tank comes elite in its stock configuration. T92 Light Tank was an innovative American light tank developed in the 1950s by Aircraft Armaments. At 18.5 tonnes, 5m length, it was designed as an airborne/airdropped replacement for the 5 tonnes heavier M41 Walker Bulldog. The T92 was never accepted into service. The main gun was a conventional 76 mm cannon with a very low profile turret. Little more was exposed than the main gun and two crew cupolas which allowed 50 caliber and 30 caliber machine guns to fire buttoned up. The engine was moved to the front, which increased protection, and a rear access door provided an escape hatch and protection while reloading; this layout was later adopted by the Israeli Merkava battle tank. It had a crew of four with a semi-automatic loading system. It carried 60 main gun rounds, and automatically ejected spent shell casings. Study of the Soviet PT-76 led to a new swimming requirement for light tanks, for which the design could not be modified. The T92 would be passed over and the M551 Sheridan was eventually adopted instead. It fielded an unconventional 152 mm gun-missile system which would suffer many technical problems, and its swimming system would be rarely used in combat. The French AMX-13 tank was a somewhat similar design that was successfully fielded. The T92's actual top speed is 56 km/h (currently 60 km/h). Rate of fire of the vehicle was only 12 rounds per minute due to the semi-automatic loading system.